Perhaps the most moving moment in the opening days of the PyeongChang Winter Olympics was when Kim Yong-nam, the president of the Presidium of North Korea’s Supreme People’s Assembly, quietly wiped his tears as North and South Korean singers sang in unison at a concert celebrating the winter games. South Korean k-pop star SeoHyun held hands with North Korean singers as images of tearful North-South family reunions played in the backdrop of the finale of the North Korean Samjiyeon Orchestra’s historic performance in Seoul on February 11. As the concert came to a close, they sang, “Be well, let us meet again. Go safely, let us meet again,” and waved their hands as the audience waved back and Kim silently wept. The day before, the North Korean high-level delegation had met with President Moon at the Blue House and delivered an official letter from North Korean leader Kim Jong-un proposing an inter-Korean summit in the near future. If realized, the meeting would be the third inter-Korean summit following the historic meetings between former leaders Kim Dae-jung and Kim Jong-il in 2000 and Roh Moo-hyun and Kim Jong-il in 2007. It is safe to assume that as long as the North and South remain in talks and continue to mend relations, the North would refrain from further testing of its nuclear weapons and ballistic missiles. And a North-South summit could pave the way for peace talks between the United States and North Korea. There is a precedent for this. 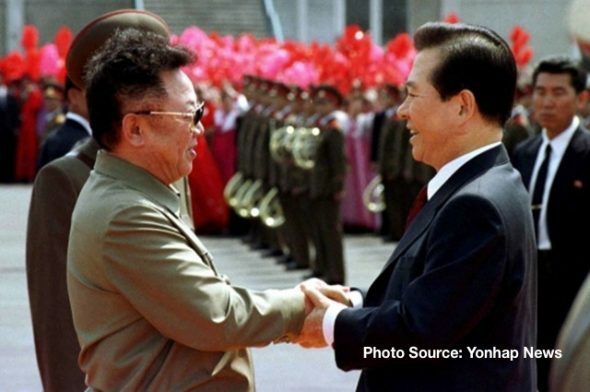 In 2000, then-South Korean President Kim Dae-jung traveled to Pyongyang to meet with the North Korean head of state. Then-North Korean leader Kim Jong-il personally greeted Kim Dae-jung at the airport, and after three days of meetings, they produced the June 15 North-South Joint Declaration, which outlined shared principles for peaceful reunification. The summit was followed by a series of North-South ministerial and military working-level talks as well as reunions of separated families in Pyongyang and Seoul in August 2000. South Korean President Kim Dae-jung received the Nobel Peace Prize for his role in the summit. On the heels of the historic summit, the United States eased sanctions on North Korea, which reciprocated with a pledge not to flight-test its long-range missiles. Just four months after the inter-Korean summit, in October 2000, North Korea’s Vice Marshall Jo Myong-rok traveled to Washington and met with then-President Clinton. They signed the US-DPRK Joint Communique, which stated that in light of the “changed circumstances on the Korean Peninsula created by the historic inter-Korean summit,” both sides agree to “remove mistrust and build mutual confidence” based on the principles of “respect for each other’s sovereignty and non-interference in each other’s internal affairs.” U.S. Secretary of State Madeleine Albright subsequently traveled to Pyongyang to pave the way for a summit between Kim Jong-il and then-President Clinton. This took place during President Clinton’s last days in office, and he unfortunately ran out of time to make the summit a reality. The momentum toward rapprochement was then quickly scuttled by George Bush Jr, who scrapped all agreements with North Korea as soon as he took office. Almost two decades later, we have another rare opening for peace. If the North and South are able to build on the momentum of good will from their cooperation in PyeongChang, they could, once again, reunite separated families and resume cross-border economic cooperation. They could also create the conditions for detente and talks between the United States and North Korea. The main obstacle, as plainly exhibited in PyeongChang, however, is the obstinate Trump administration, unwilling to veer off its warmongering path. On his way to PyeongChang, U.S. Vice President Pence met with Japanese Prime Minister Abe in Tokyo on February 7, then vowed to “unveil the toughest and most aggressive round of economic sanctions on North Korea ever.” As if waging a one-man protest, Pence then toured South Korea’s Navy 2nd Fleet Command in Pyeongtaek, where he met with North Korean defectors. He prompted international rebuke after he sat dour-faced and refused to applaud during the Unified Korean team’s introduction at the opening ceremony of the Olympics. That’s not all. After arriving fifteen minutes late to a reception for world leaders hosted by President Moon, Pence made an awkward point of shaking everyone’s hands except for those of Kim Yong-nam, then decided to skip out on the dinner altogether to avoid sitting across from the North Korean official. In lock-step with Pence, Japanese Prime Minister Abe, too, tried to rain on South Korea’s parade. He caused a commotion by ordering an inspection of underground parking garages around the PyeongChang Olympic Stadium in preparation for evacuation of Japanese tourists in the event of a North Korean missile attack during the winter games. At a meeting with Moon on February 9, he insisted South Korea resume its joint Key Resolve Foal Eagle military exercise with the United States after the Olympics. He also demanded South Korea uphold the “final and irreversible” bilateral pact on the comfort women issue and remove statues of comfort women that have been installed in several countries, including the United States, Australia and Germany. In reply, Moon essentially told him not to meddle in South Koreas’s “sovereignty and internal affairs” and suggested that Japan instead ought to reflect on history. 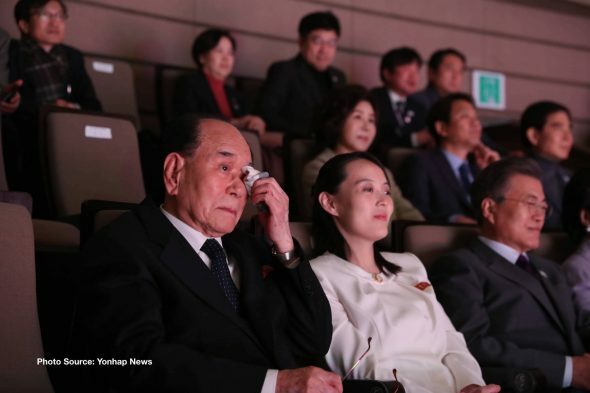 This fraught exchange was probably fresh in Moon’s mind as he watched Hyun Song-wol, the leader of North Korea’s Samjiyon Orchestra, in a surprise performance in the finale of the February 11 concert, revise the lyrics of a North Korean song to sing, “Dokdo, too, is my country” (referring to the contested Dokdo/Takeshima Islands between Korea and Japan in the East Sea). The United States and Japan are currently conducting joint military exercises even as the Winter Olympics are still ongoing. The dock landing ship USS Rushmore, with elements of the U.S. 11th Marine Expeditionary Unit and the Japan Ground Self-Defense Force (SDF), concluded five days of amphibious landing exercises off the Southern California coast on February 7. The annual Cope North exercise, involving more than 100 aircraft and 2,850 personnel of the U.S. Air Force, Marine Corps and Navy, as well as the Japan Air Self-Defense Force and the Royal Australian Air Force, began on February 14 and will take place in Guam and the Commonwealth of the Northern Mariana Islands through March 2. The Japanese Maritime Self-Defense Force and the US Navy will also hold a four-day computer-simulated joint missile defense drill on board Aegis destroyers starting February 16. Key Resolve Foal Eagle, the joint US-ROK war games that happen every year in the Spring have been delayed this year due to the Olympics but are scheduled to resume in April. Ulchi Freedom Guardian, another massive joint military exercise, is scheduled for August. These exercises are offensive war games. Last year’s Foal Eagle involved 300,000 South Korean and 15,000 US troops, including the notorious SEAL Team six, the unit that assassinated Osama Bin Laden. It also involved B-1B and B-52 nuclear bombers, F22 and F35 stealth fighters, as well as an aircraft carrier and a nuclear submarine. These exercises rehearse OPLAN 5015, a war plan that includes special forces assassinations, contingencies for North Korea’s regime collapse, preemptive strikes, and the so-called Korea Massive Punishment & Retaliation (KMPR) battle plan, which involves surgical strikes against key North Korean leadership figures and military infrastructure. The upcoming military exercises pose the greatest obstacle to efforts for peace and North-South reconciliation in the current moment. If they move ahead as planned, North Korea will almost certainly respond by resuming nuclear and/or ballistic missile tests. Moving forward with the joint war games, in other words, is the surest way to undermine the process of detente that has begun between the North and South through their Olympic cooperation. A North-South summit that can pave the way for talks between the United States and North Korea is our only chance at peace on the Korean peninsula. It is essential, therefore, for those who desire genuine peace in Korea to raise a unified voice urging the White House and the Pentagon to halt the provocative joint war games and support the Korean initiative for dialogue. Let us nurture the seed sowed in PyeongChang to take root for lasting peace. In the end the only way to peace is for the United States to get its brainwashed paid thugs off the peninsula entirely. This includes overflights and menacing naval vessels. A satisfying read. US: Get the hell off the Korean Peninsula and don’t think of returning until you are ready to negotiate, in full good faith, the Peace Treaty required by the 1953 (sooo looong ago!) Armistice Agreement.